There’s this magical thing that happens when you slice up a loaf of challah: yeasty cumulus clouds fill the board! 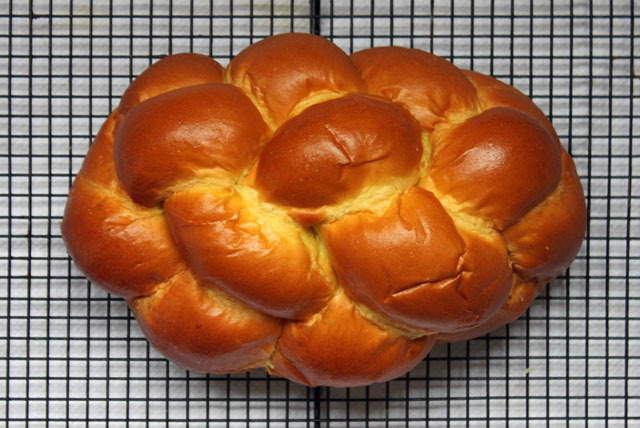 The braided kosher egg bread is so beautifully golden and perfect for french toast that it makes any cloudy day feel sunny. Since I had the eggs blown out from my little seasonal decorating project, I made my Orangina French Toast and decided to share the recipe here. I went through a phase a while back using fizzy beverages in my cooking (Limonata, Jarritos, Ginger Ale, you name it). In my head it perks up anything; who knows if something really is happening there. I may just like the excuse to purchase single soda bottles, add a portion to the recipe, and finish drinking it while cooking (if you cook with wine, you know what I am talking about). The first time I had Orangina was at the rooftop cafe of the Uffizi Gallery in Florence. Needless to say, it was a good day. Since Christmas, I have been keeping my new recipes and cards in the book in the first picture: a gift from my brother-in-law’s folks! I will treasure it till the cows come home. Whisk together first four ingredients. Soak challah in mix for several minutes. Sprinkle with zest and splash with Orangina. Melt one tablespoon of butter (sub oil or use bacon drippings) in skillet. Fry orange clouds over medium heat until golden. Dust with powdered sugar, fruit, or your fav. light amber syrup. Buongiorno! I miss Orangina! The first time I had it was in the south of France on a high school trip with my French class. So refreshingly delicious. I miss it. I hear you! I gasped out loud when I saw it at the local grocery store here. P.S. I would looove to visit the south of France before I die. How wonderful! I was able to visit when I was in the Navy. Kinda not the same..but still nice. This looks tasty and what a fun idea-cumulus clouds! Have to remember this one. This looks like a great version of my favorite breakfast food! Can’t wait to try it. let me know the opinion of the jury! you’re welcome. hope you have the chance to try it out for yourself! Many thanks. Breakfast tomorrow: checked off the “to plan” list! wow, that looks great. My kids would love it. Thanks for the recipe. Ooh, I’ll have to try that! I always make French toast, I never even thought of using orange flavours. Looks and sounds delicious! I’m looking forward to Sunday brunch already! I don’t even know what Orangina is!! Off to Google it so I can make these. Looks good… Thanks for the recipe! Looks excellent! I’ve been trying to think of something special to make my mom on Mother’s Day…I think these’ll be perfect. yes, and pretty simple. hope you have a great time together. FABUOUS!! Definitely putting this on the list for a Sunday breakfast! Such a creative idea. Love it! really impressive! I make a good cook but a sad baker…sorta kinda jealous. congrats of making Freshly Pressed! This looks amazing! I may just have to run out to the grocery store to jazz up breakfast in the morning! Wow! They absolutely do look like clouds. Delicious, edible clouds. Great photos too, thanks for sharing. Rocking recipe! 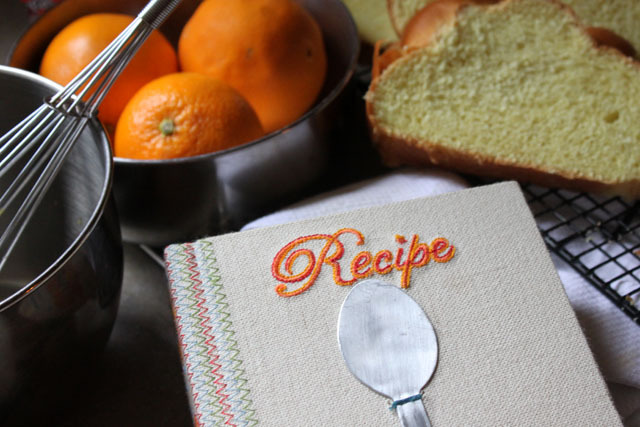 I just introduced my daughter to Orangina the other day – I shall make this recipe soon and I hope it tastes as exquisite as you have beheld it in your wonderful writing! Nice idea and great presentation. We loved Orangina growing up and visiting France every year (from the UK) and now my kids love it too. Don’t think I can get it on my Carribean island though, but will check. Hi, cute post! Does the fizz in the Orangina do anything for the french toast batter? Make it lighter? not really sure, but I like the taste! mmm. orangina! I can almost taste that french toast, those pics are mouthwatering! This looks seriously delicious! And that recipe book is the most attractive inanimate object I think I’ve seen in a long time 😉 Congratulations too on your amazing food photography: it’s such a challenging medium. Fantastic post – will definitely be trying this, thanks! I know! Megan, the inside pages are so colorful too. Hope you enjoy the French Toast. GREAT IDEA! i love it and can’t wait to give this recipe a try! Awww.. I love clouds, and I love your cloud-shaped toast more! Thanks for sharing. The post really makes my day sunny! 🙂 Keep up the good work! thank you, and more sunny days to you. I like mine with butter and nutella! Orangina is the BEST! I’m trying this… can’t wait. Oh man. My mouth is watering. Congratulations on being Freshly Pressed! My mouth is watering lol I shall make this for breakfast sometime! Novel idea! I liked Orangina for about two weeks in 1993. It’s a bit of a mystery where it was before and after those two weeks. Now, if you can concoct something with Royal Crown and Virgin Cola, I’d be curious. I’m going to bed right now so I can wake up early and make some of your great challah french toast. Great photos. Mmm… can’t wait to try it! Simply divine and mouth-watering. Thank you for sharing this! So cute and I ALWAYS want french toast! Yay. What fun and creative recipe. I love orange zest and have not used it with French toast. Glad to have found your blog. Looks delicious – I think the cloud shapes make a delightful presentation…I love everything about France and can’t wait to go back. Will check back to see more of your blog soon. thank you! I hope to visit France someday myself. I just saw a similar idea the other day – first time I even thought of using challah for French toast because it’s quite the opposite to French toast I know – soft. Looked really moorish though, and this extra twist on it that you’ve added…clouds…wonderful! Love the orange idea too! Thanks for sharing! get thee to a grocery 🙂 happy saturday to you. Reblogged this on Summer's Blog. This is wonderful! Once in a desperate attempt for a mimosa, I tried using Orangina. It was an all around failure, so it’s great to see an actual recipe for that orange-y goodness. Such a cute idea! Thanks for sharing and congrats on FP! Looks amazing. Beautiful photos, too. How I love Orangina and French Toast! Great post and congrats on FP! I’m a bit of a french toast fiend, orange is a clever new flavor to add. Taste must be delicious.. brioches? Another reason to love french toast! Those look so cute and delicious. It really would feel like a sunny morning if you ate them with those golden brown eggs. Nom nom nom! Ah, man, seeing that maple syrup drenched over that orange French toast, my mouth is watering. YUMMY!!! I love challah bread and making french toast with it is delicious!!! Love anything with Orangina. Thank you for sharing this!!! you’re welcome, Jan. thanks for popping by my blog! Looks really nice, great idea! Yummmm! I’ve never had french toast with orange peel in it but it seems like some zest would be really delicious. Great post. Yummy! 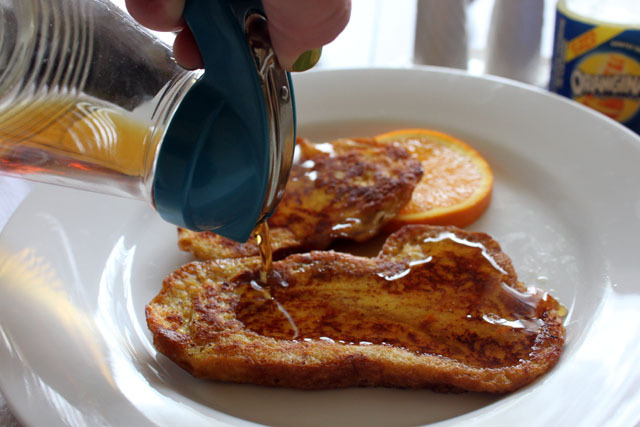 I love oranges and an orange flavoured french toast is definitely worth a try! I can’t wait to try them in my kitchen.. Thanks for sharing 🙂 we don’t get orangina here but any orange flavoured soda should do right? orange soda would be great! Wonderful presentation. I will have to enjoy some for breakfast this morning. Beautiful pics and the toast looks so yummy! The first time I encountered Orangina was at a sidewalk cafe in Paris. Everytime I see Orangina, it brings back memories – love it! Thanks for sharing this memory. sidewalk cafe in Paris sounds lovely, lovely. I love french toast and love orangina so this sounds and looks delicious 🙂 Thank you for the great idea. you’re welcome – hope you have fun with it. Love, love, love this blog and your writing style! That french toast has my stomach growling terrible now. Just stopping by to say hi. Would love if you visited my Advice Column http://askjanegold.wordpress.com – Just getting started up today! Hi Jane Gold! thanks for stopping by. best wishes in your new venture! Wow, these look like some pretty epic recipes! Seem like great summer dishes, thanks! Perfect way to start a Sunday morning! What a great idea! I’m totally making myself a loaf of challah tonight. My kids will die when they see this. hope the kids liked it! Boo. I only had multigrain flour so I didn’t make the challah. But I will! And when I do, they’ll love it. ohhhh.. I can’t wait to veganize this recipe…this looks SOOOO good!! awesome. please leave a comment one you’ve transformed the recipe so I can link back for the vegan world! Adorable! Love it 🙂 I’ve been needing some new recipes for work, and this one looks like it’d be a fun alternative to our normal French Toast! Thanks for sharing! I love to bake, and make french toast quite often… never thought of making it with challah bread… love the shape it makes! But, isn’t it too soft? Does it get soggy? I’ve also never thought to use bubbly drinks in baking.. but I’m totally gonna try it! We can get Orangina, even here in Idaho, lol. Hello, Idaho! The challah is normally a few days old, so it’s not too soft. If it’s fresh, I might toast it before soaking it in the liquid mixture. I suppose it’s possible to get soggy, so just gauge how much liquid you are putting on the bread. Oh.. and by-the-by…. we never-ever use maple syrup on our french toast. We put butter, then powdered sugar (which partly melts into the butter and partly gets crunchy, sort of hard to explain) then cinnamon on top. It’s fantastic! It’s the only way I like to eat it! I’ve tried syrup but don’t care for it (on pancakes, sure!) My family has always done it this way… does anyone else? I love cinnamon on top! I only learnt what french toast was a few days ago so I will definitely be trying this out! YUM! THIS IS AMAZINNGG. YOU MUST SEE THIS MY PRECIOUS READERS! Dear lord, Orangina AND french toast? Two of my favorite things, kill me now! stay alive! 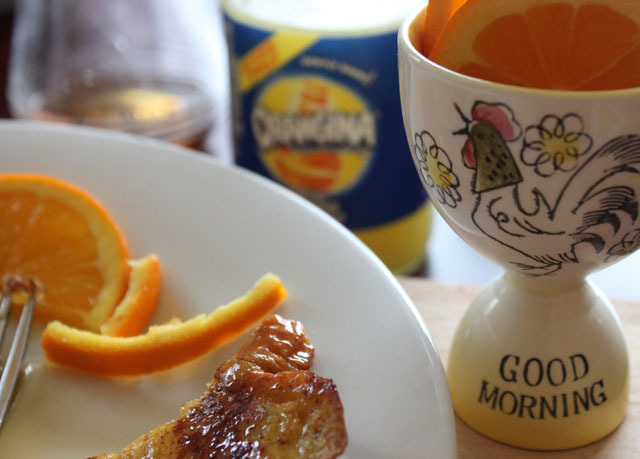 eat orangina french toast! Would you mind posting that cloud pic with the knife to the Cloud Appreciation Society blog? I have been thinking of a cookie recipe with some pop lately… please share when you come up with something! banana bread makes yummy french toast! Challah makes the best french toast! Love the clouds! Congratulations on being Freshly Pressed. I agree… in any flavor variety! What a FANTASTIC idea!!! Orangina! Thank you! That will definitely be on this weekend’s list. you’re welcome…. the weekend’s a-comin’! looks a little too good! This looks so cool! I really want to try it! My friend loves to bake I’ll have to give her the recipe! 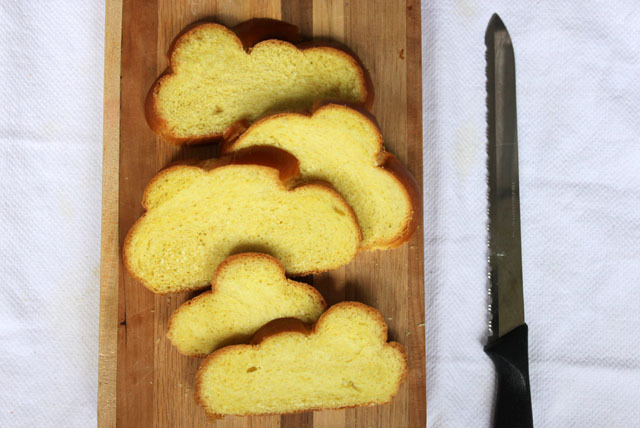 Words cannot express how much I love the fact that this bread slices into the shapes of clouds! I love it. Looks and sounds good! Never would have thought to use Orangina like that. Same with challah. I will absolutely have to make this recipe. I make my own challah and add orange zest to the dough, can’t wait to try this one of these weekends. your challah sounds delicious. especially as cinnamon toast! What a neat idea! Do you make your own challah? I like Orangina too…never thought of cooking with it! What does the “fizz” do when you cook it? Congratulations on being Freshly Pressed! I don’t make my own challah, but I would like to! Good Evening: I didn’t have Orangina, but fresh-squeezed OJ worked very well, and these are sensational topped with sliced strawberries and powdered sugar. Thanks! Oh wow, this is very original. I imagine the orange zest and cinnamon make an interesting pair. The fresh, distinct citric flavor of orange and the light smokiness of the cinnamon should prove to be a pleasant breakfast. Yay for Challah bread! MMMMM. Well I have my saturday brunch all figured out. Yum! Oh my….Orangina….sounds divine! I have to make the Challah myself, but when I do will definitely make this! Yuuuuummmmyyyyy! They look so good! I’m from Italy, so I can found Orangina everywhere, but I never found a recipe with it that was this good! love this!! i have to make this. looks yummy! looks yummy! nice way to enjoy your first Orangina. i love your photos! I will for shore be practicing these for when my son is big enough to eat solids! how cute. Reblogged this on Open Kitchen. These are adorable! I couldn’t agree more that challah makes for some bomb-diggity French toast. The orange and cloves are a fantastic touch. Well done! What a great idea. I’ll have to try that. 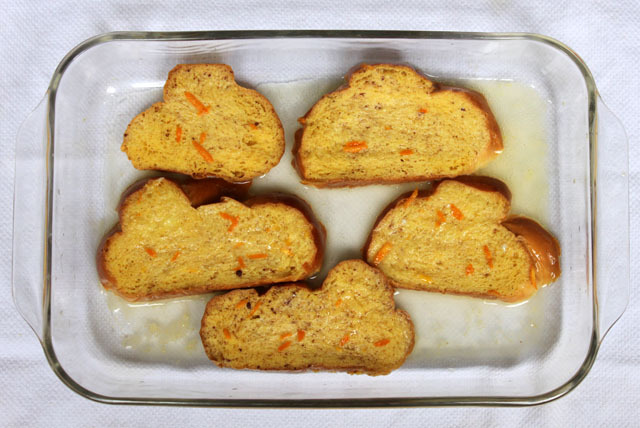 I’ve used Texas Toast which makes deliciously thick french toast but I love that yours look like happy little clouds! I love this recipe and the way you show, thanks for share, beautiful!